?? The Alaska Coin Exchange ?? What is my coin worth??? This is not a specific question that I received from somebody, but I get this question on a daily basis asking about a variety of coins from circulated 1942 Mercury dimes (bullion value) to 1804 silver dollars (bullion value too, if you are lucky enough to have one of the fakes that is at least made from real silver). The reality is that I can't answer this question. Coins need to be seen in person to properly evaluate them. I suggest that you see a local dealer or better yet attend a coin show that is occurring in your area or even better than that, stop in at a local coin club meeting. Remember that there are two values for each coin. There is wholesale (what a dealer will pay for the coin) and there is retail (what you will pay to buy this coin from a dealer). When you get an evaluation from somebody, be sure you know which of these two values you are being quoted. Why don't you take credit cards? We do, but only through Paypal. There are two reasons for that. First, the credit card companies charge a steep monthly fee plus a healthy percentage of the total transaction. Paypal charges 2.2% of the transaction amount and no monthly fee, which is a lot more reasonable though still too high in my opinion. The second reason is for security. I never see your credit card number and have no access to that information so it can't possibly be stolen from me. Paypal is a method for us to receive credit card payments without accepting the credit cards directly. Small merchants are charged a fortune to accept cards directly, and Paypal gives us a way to avoid these excessive charges and still receive credit card payments. You do not have to join Paypal to use it as a method of making a credit card payment. I get the vast majority of orders shipped within 24 hours of when they are received. Mail service from Alaska is not the fastest, and typical shipping time for either first class or priority mail shipping is about 3 to 6 days. Express mail is 2 to 3 days. If you are paying by check, allow about 10 extra days on top of these estimates to allow time for your check to arrive here and clear the bank. I am having a problem adding an item to the shopping cart, or seeing a picture of a coin, or some other malfunction of the website. Please tell me about it! The three websites have several million lines of html code and there are inevitably errors in a few places. If you tell me about a malfunction I can usually correct it quite easily. How often are the websites updated? Pretty much every day, seven days a week. Usually I do the update late at night when traffic on the websites is minimal. That is why you may get a note from me saying that a particular item has been sold when you can still see it listed for sale on the website. It should disappear from the listings when I do the nightly update. The updates take half an hour or more to synchronize between my computer here and the website host's servers so that is why it is generally only done once per day. What is the Coin and Stamp Gallery? The Coin and Stamp Gallery is a website that I built to display the many thousands of coin and stamp images that I have created over the years. I have received many compliments about the website, and I get lots of email messages from people who have spent hours looking at the large number of images. Occasionally somebody asks why I keep the site up and running since it costs a good bit of money each year for website hosting not to mention that it obviously takes a great deal of time to maintain and keep up to date. The answer is twofold; one is that I enjoy working on it and my customers enjoy looking at the pictures, and the other is that even though there is nothing for sale on that website there are many links back to the Alaska Coin Exchange and Pre 1917 Proofs websites so it does indirectly generate some business. May I set up a link to your website from my website? Yes, feel free to do so. I currently have many dozens of websites with links to one, two, or all three of my websites. I appreciate the publicity! I also have a great many more links coming in from a variety of numismatic forums and personal websites such as Myspace. No. Please let me know if you see anybody selling coins or anything else using the Alaska Coin Exchange or Pre 1917 Proofs names. Do you sell coins on eBay or any other auction site? I don't and never have. I won't say that it will never happen because never is a very long time, but currently I do not have any plans to do so. I have nothing against auctions, but at the current time there are just way too many of them. Besides eBay and the numerous other general merchandise auction websites, it seems like there are countless coin dealers that have set up coin auction websites as well. I guess it is just my personal preference, but I would rather just know what the price of an item is rather than going through the whole bidding routine, which is time consuming, and wondering if I will win the lot or not. It can be exciting but also frustrating. I also consider auction fees to be way too high anyway at about 15% to 25%. I have a lot of customers who buy material from me to sell on eBay, and I know they do very well with it. For the foreseeable future I plan to remain as a fixed price seller. Your prices seem very reasonable. How do you do it? As you may have heard from many other internet only companies, low overhead is the key to lower prices. I have no store to pay rent on and no staff to pay wages to. The only notable fixed expenses I have are a few hundred dollars for website hosting, a few hundred more for the bank deposit box where the coins are stored, and a hundred more for the Post Office box rental. Most coins are listed for sale at the Greysheet Ask price. Do you send out email lists or any other regular correspondence? Can I opt out? There is nothing to opt out from. I do not send out any email messages to my customers except for an occasional question or notification about an order, or simply a response to a question you have. You will never receive spam from Alaska Coin Exchange. If you ever do receive spam that appears to be from Alaska Coin Exchange, Pre 1917 Proofs, or Coin and Stamp Gallery, please forward it to me so that I can investigate. Do you sell our email, mailing address, or any other personal information to anybody? No. In fact I do not even maintain a listing of my customers email or mailing addresses, so nobody can even steal that information off my computer since it does not exist. I do save a copy of all correspondence and orders received just in case I have to refer back to them for some reason. These messages get backed up onto a CD about weekly then deleted off the computer. I know you produced and mailed out Alaska Coin Exchange catalogs during the 1990's. Do you have any extra original copies for sale? Sadly I don't. I made the unfortunate mistake of throwing away my extras because they were seemingly just taking up space. I now know that they sell for up to a few dollars each. Who would have ever guessed that would happen? Anyway, I do have about 1 to 3 copies of each, even right back to the original flyers that I handed out at coin shows in Alaska in the 1980's. I also have one copy of each monthly catalog in which I would write notes about which coins had sold out and new items received during the month. I have been offered a surprising amount of money for the set with my handwritten notes inside, but they are not for sale. No, sorry to disappoint you! 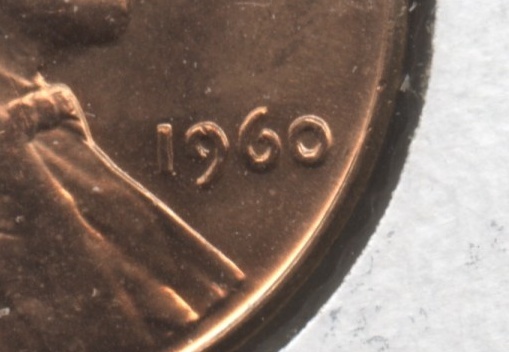 How do I tell the difference between the 1960 Large Date and Small Date Lincoln cents? I use the number 6 in the date. Compare the number 6 in each of these pictures. 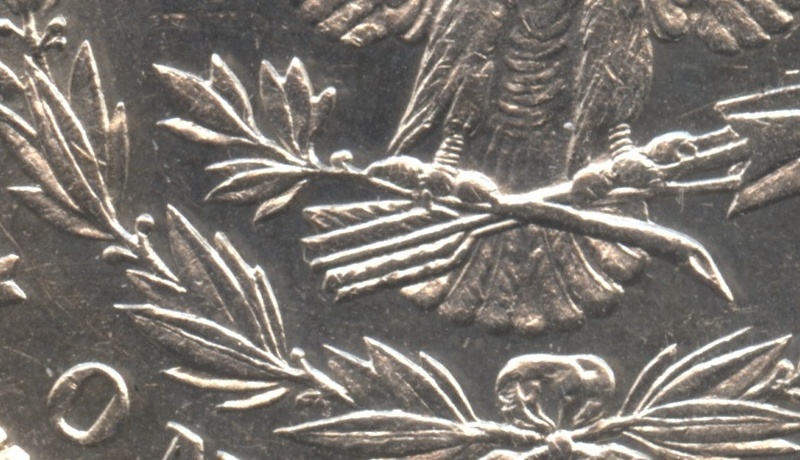 The top stem of the 6 sticks up way higher on the large date cent than the small date cent. The date is the same on both the Philadelphia and Denver issues. Of course, since they are quite inexpensive, the best way is to purchase one of each for comparisons. The Denver small date is less expensive than the Philadelphia issue, and works just as well. How do you tell the difference between the Variety 1 and Variety 2 Eisenhower Dollar reverses? These are actually quite easy to tell apart, especially if you have one of each to compare. The lettering on the Variety 1 coins is much thicker than that on the Variety 2. 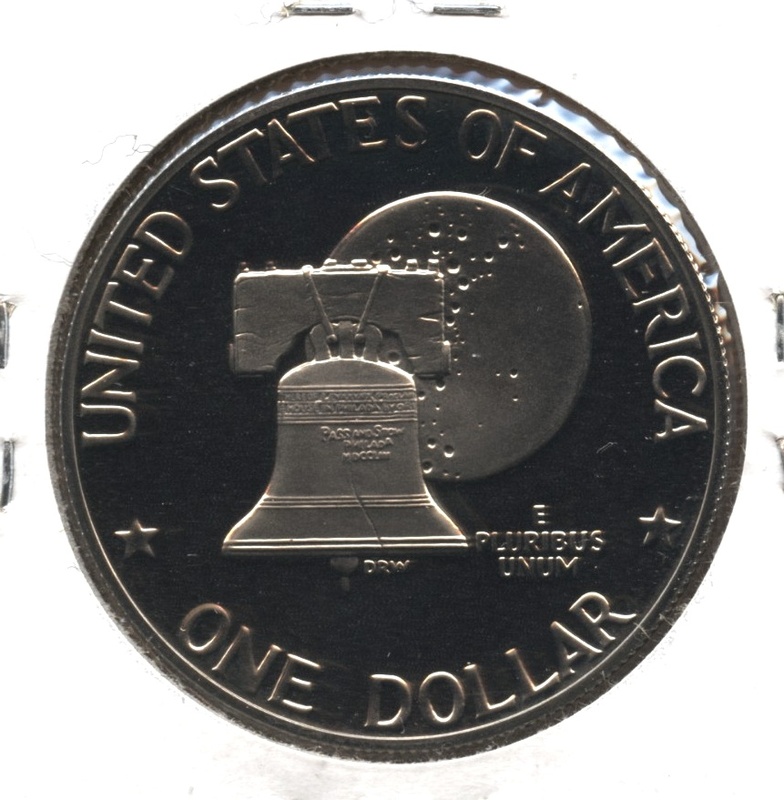 The letters on the Variety 1 coins are noticeably wide, and flat on top, and do not resemble the reverse lettering from any other year in the Eisenhower dollar series. The variety to which you are referring is known among specialists in the series as Overton-114 (O-114). 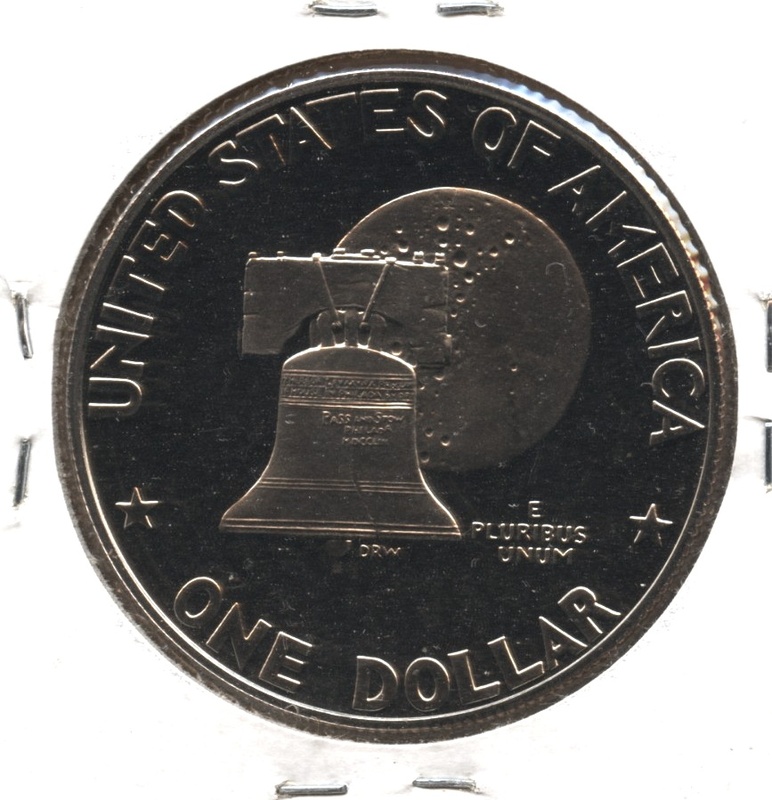 It is fairly easy to identify because the words United and States have very little space between them and that particular reverse is sometimes called the UNITEDSTATES reverse because of this characteristic. This reverse die was first used in 1828 and then again in 1829, and it can be found on these dates relatively easily and for a minimal premium. However only 16 pieces have been traced for the 1830 edition, making it rare indeed. The year 1830 would be the last time this die was put to use. I was searching to find out why some cents were red and others brown. I assume it is oxidation (how they were stored) and had nothing to do with how they were minted but I am not sure. No one explains this. Maybe you should on your site! Since there is one dummy, there are probably others! Copper coins turn brown over time, and the speed which this occurs is dependent upon the quality of the copper to begin with, how the coin is stored, and the environment in which it is stored. So, it is a combination of factors, any one of which can result in a red cent turning brown. They all start out red, and it seems inevitable that they all end up turning brown eventually. I found two memorial cents that don't have the designer initials on them. 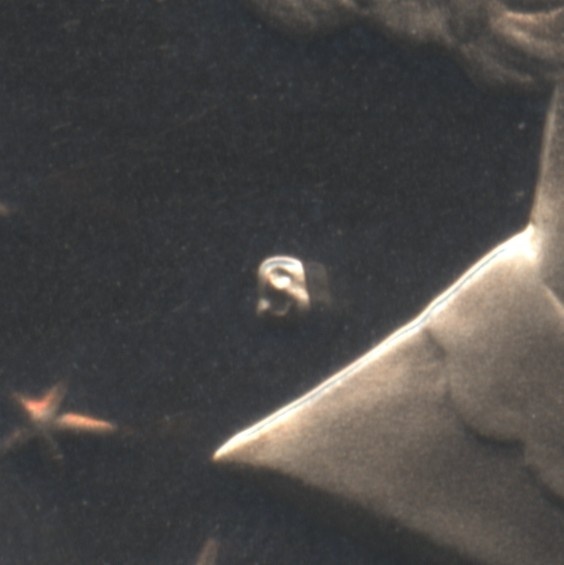 I looked at the area on the reverse where the "FG" should be with my over-10x microscope, but the initials aren't there and there's no indication of anyone messing around with the coins, i.e. counterfeiting. Is this a known variety? Is this not unusual? Sorry to say, what you have is a very common kind of error known as a filled die. 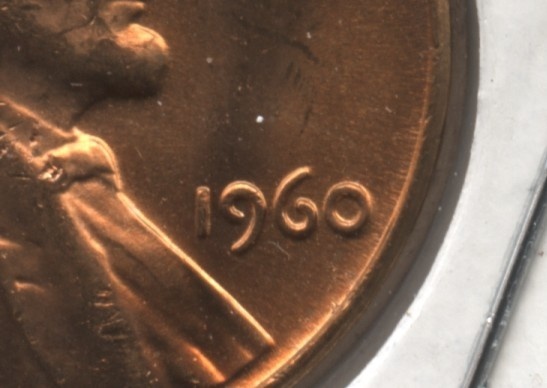 A bit of grease or some other debris will fill in those tiny letters on the die so that they will be missing from the coin when it is struck. Valuation wise, they carry just a small curiosity premium at best. The good news is that they are not counterfeit or altered! What does the term "Baggy" mean? You may have heard about coins being stored and shipped in canvas bags. That is where the term is derived from. This particularly applies to the heavy silver dollars and to a lesser extent half dollars. When the coins jostle around inside the canvas bag, the edges of some of the coins impact against the surfaces of other coins in the bag, leaving an imprint of the reeds on the edge. When lots of these impact marks are visible, the coin is referred to as being "baggy". How do I tell the difference between the Reverse of 1878 and Reverse of 1879 Morgan Silver Dollars? Morgan Silver Dollar Reverse of 1878 (Second Reverse). Look at the photo above, paying close attention to the feathers on the arrows. Notice that the top feather is parallel to the other arrow feathers. Morgan Silver Dollar Reverse of 1879 (Third Reverse). 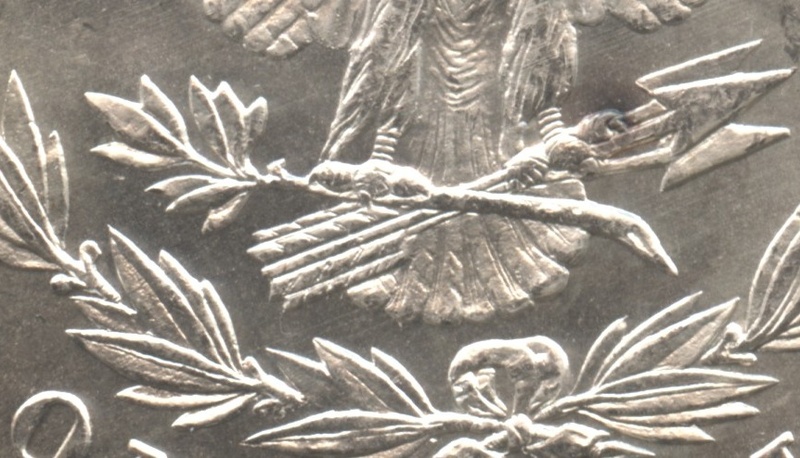 Now look at the arrow feathers on this reverse. The top feather is noticeably slanted in comparison with the other feathers. This is the easiest way to tell the difference. I recently acquired several 1979 and 1981 proof sets, and was hoping to get a type 2 SBA from either year. Honestly, the “S” all look the same to me and I can’t tell the clear “S” from the blob “S”. Can you offer any suggestions? Thanks for your time! My pictures did not come out so great, but hopefully they will help. First, the 1979-S Type 1 and 2. 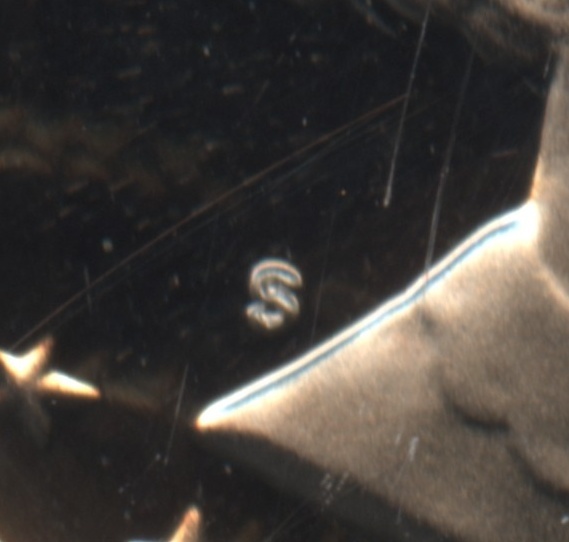 The difference in 1979 is that the type 1 coins have a filled S mint mark while the type 2 coins have a clear S. The type 1 coins range from only a bit filled in to so badly filled in that they appear to be a blob that is hard to identify as a letter S. You will notice in the 1979-S type 1 picture below that the S is reasonably clear but the serifs are connected to the curves in the S. The 1979-S type 2 is much clearer and has almost no serifs. The tips of the letter are well clear of the curves. It is a completely different story in 1981. The difference is in the serifs on the letter S, as both types are fairly clear. 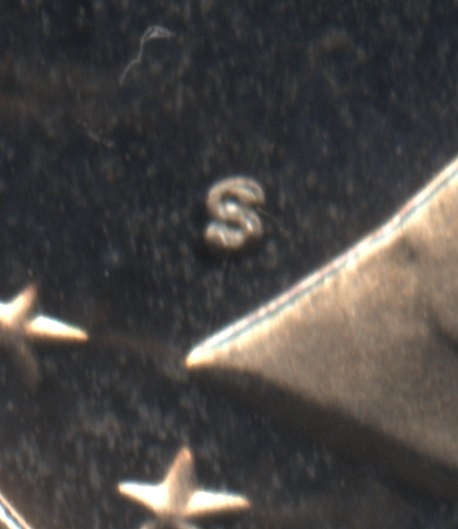 The 1981-S type 1 mint mark is essentially the same as the 1979-S type 2, with no serifs on the ends of the letter. 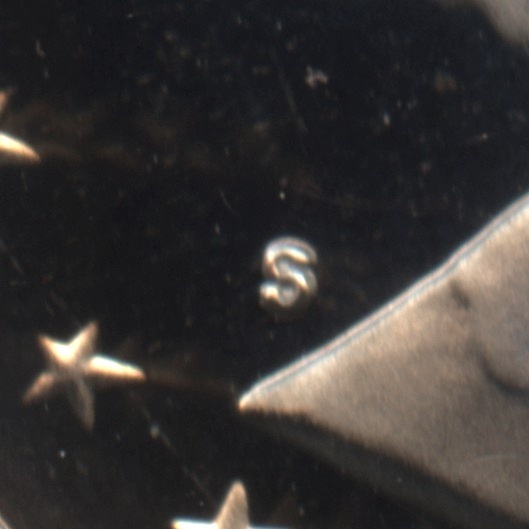 On the 1981-S type 2, you can see that the ends of the letter S end in a round bulb.